The Emergency Carer's Card scheme is designed to provide you with peace of mind that your contingency plans be accessible to all should any unplanned emergency occur to you. The scheme is open to all carers aged over 18 years, who are caring for a person who is also over the age of 18 years, who live in Cornwall. 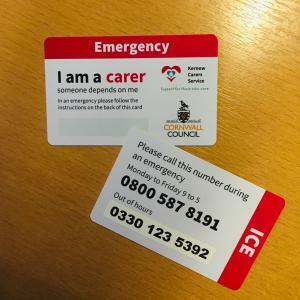 What is the Emergency Carers Card scheme? The Carers Emergency Card Scheme is for carers who are concerned about what would happen if they were taken ill, in an accident or if another emergency stopped them from getting to the person they care for. The scheme gives peace of mind that, should something happen to prevent you from providing care, the person you care for will not be left without support. This enables the person you care for to receive the care they need whilst remaining in their own home until the emergency is over or until other arrangements can be made. You provide details, using the application form, of two people who can provide care to your loved one, should anything happen to you. In the event that these people cannot be contacted or are unable to assist, adult social care will provide care for free for the first 24 hours. If something happens to prevent you from caring, you will be able to access the scheme by calling the phone number(s) on the card. Once through to the operator, they will ask you for your unique ID number which is also on the card. Once the operator has your ID number, they will be able to bring up your emergency contacts and action some care. This could be as simple as contacting a named friend or relative, right through to arranging professional help. An emergency is an unplanned event that prevents you from providing care. Under the scheme, anything that stops you from carrying out your normal caring role will constitute an emergency. Within the scheme, an emergency can be a minor emergency, such as your car breaking down, being stuck in very bad traffic or an emergency doctors or dentist appointment. Or it could be a larger emergency such as being involved in an accident, suddenly being admitted to hospital, a close relative being taken ill, a real risk to employment on a particular occasion. It is not planned respite of any kind or any pre-planned appointment cover. This scheme is intended for unplanned emergencies only. Any misuse of the scheme could result in cancellation of the service. What is the card like? The card is designed to fit in a wallet, purse or pocket, enabling it to be carried at all times. The card will include the phone number to call in the event of an emergency and a unique ID number. 24 hours a day The scheme can be accessed, 7 days a week, 365 days a year in the event of an emergency. Once complete, you will be taken to the Emergency Carers Card Online Application. Complete the application and either print off your own signature form, or we will send one to you. Once we receive your signature form in the post, we will review your application. Once approved, you will then receive an Emergency Carers Card in the post. Once we receive your signed form, we will review your application. Successful applications will then receive their Emergency Carers Card back by post. Apply online by joining Cornwall's Carers Register, once your registration is complete, you will be able to access the form. Signing up to the register will also entitle you to the quarterly newsletter, which keeps you in the loop about what is happening for carers in cornwall.